The following is a repost of Fisk's article from The Independent on Sunday. He is talking about the incidents of CNN senior editor Octavia Nasr and the British Ambassador to Lebanon, Frances Guy. I might have guessed it. CNN has fired one of its senior Middle East editors, Octavia Nasr, for publishing a twitter – or twatter in this case, I suppose – extolling Grand Ayatollah Sayyed Mohammed Hussein Fadlallah of Lebanon, calling him "one of Hizbollah's giants whom I respect a lot". Well, he wasn't Hizbollah's man, but no matter. He was definitely a giant. A man of immense learning and jurisprudence, a believer in women's rights, a hater of "honour crimes", a critic of the theocratic system of government in Iran, a ... Well, I'd better be careful because I might get a phone call from Parisa Khosravi, who goes by the title of CNN's "senior vice president" – what these boss types do or what they get paid for their gutless decisions I have no idea – who said this week that she had "had a conversation" with Nasr (who'd been with the company for 20 years) and "we have decided that she will be leaving the company". Oh deary, deary. Poor old CNN goes on getting more cowardly by the hour. That's why no one cares about it any more. That can't be said about Fadlallah. The Americans put it about that he had blessed the suicide bomber who struck the US marine base in Beirut in 1983, killing 241 service personnel. Fadlallah always denied this to me and I believe him. Suicide bombers, however insane we regard them, don't need to be blessed; they think they are doing God's duty without any help from a marja like Fadlallah. But anyway, Washington used Saudi money to arrange a car bombing to assassinate Fadlallah in 1985. It missed Fadlallah. But it killed more than 80 innocent people. I do wonder what Ms Khosravi would have thought of that. No comment, I guess. And now it turns out that the British ambassador to Lebanon, Frances Guy, has written on her personal blog that Fadlallah was a man she respected and most enjoyed meeting in Lebanon. What possesses these personalities to have blogapops all over the place I have no idea. But Ms Guy has incurred the anger of the Israeli foreign ministry, whose spokesman says it would be "interesting" to know what the British Foreign Office thinks of her remarks. Personally, I would be far more "interested" in what the Israeli foreign ministry knows of the British passports its government forged in order to murder a man in Dubai not many months ago. But it just goes to show that Fadlallah – who was also a poet – can get people's backs up, even in death. When my friend and colleague Terry Anderson was kidnapped in Beirut – at almost seven years underground, he qualified as the longest-held hostage – I went to see Fadlallah, whom Anderson had himself recently interviewed. "He was in my home and he was under my protection," he said to me. "I regard him as my friend." This remark might have been what kept Terry alive: by extraordinary chance, Terry was back in Beirut this week with a party of students, although I always wondered if his visit to the southern suburbs of the city was what got him nobbled. In those days, we journos called Fadlallah Hizbollah's "spiritual mentor", though that wasn't true. 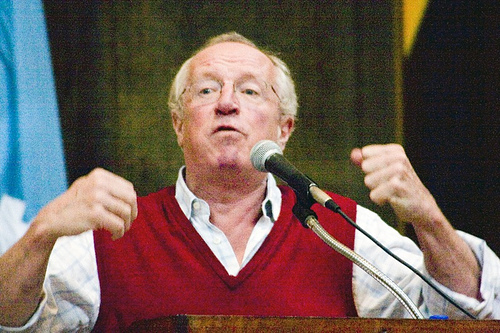 He did support the Lebanese resistance during Israel's invasion of Lebanon in 1982 and he was a fierce opponent of US policy in the region – like almost everyone else in the world, including the US, it seems – and he demanded an end of Shia blood-shedding ceremonies at Ashura (when Shias mourn the killing of the Prophet's grandson). I went to see Fadlallah again with kidnapping much on my mind. I was heading off to Baghdad and sought his guidance on how to avoid being abducted. He listened kindly to me and announced that I should see a close Shia Muslim religious friend of his in the Iraqi capital. This I did. And was escorted to Najaf and Karbala by an associate of the friend who sat in his religious clothes in the front of the car, reading the Koran all the way. "I was very worried for you," Fadlallah's friend said when I returned. So now you tell me, I exclaimed. But there was a further reason for Fadlallah's help. For every hour I was in the Iraqi holy cities, I had to meet a Shia clergyman, each of them former students of Fadlallah. And each of them would hand me a vast pile of writings and documents – their accumulated sermons over the past 10 or 15 years. To each I promised to pass their papers to Fadlallah. And thus it was that, a month later, a suspicious-looking Fisk turned up in the southern suburbs of Beirut with two massive suitcases. Fadlallah greeted me with a huge smile. He knew what the bags contained. Fisk had been a courier for more jurisprudence than he could imagine. And Fadlallah knew what his colleagues in Najaf and Karbala were talking about. I couldn't, frankly, care less what senior vice president Khosravi of CNN thinks of this story – though spare me one of her "conversations" – nor do I care what the Israeli foreign ministry thinks. Nor British ambassadors, for that matter. But I do believe that Fadlallah was a very serious and very important man whose constant sermons on the need for spiritual regeneration and kindness did more good than most in a country constantly flooded in a rhetoric bath. Hundreds of thousands attended his funeral in Beirut on Tuesday. I am not surprised.